25 June, 2012 is internationally celebrated as the Day of the Seafarer. This unique day was chosen truly by the international maritime Organization (IMO). The organization all decided that the participation made by seafarer to world business and economy should be identified by means of a unique day. 25th June, 2011 was selected because it was the day on which changes were created to the International Convention on Standards of Training, Certification and Watch Keeping for Seafarers. 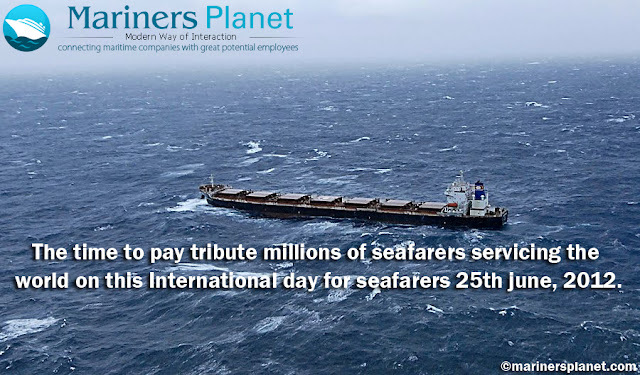 The day is considered to pay honor to the planet's 1.5 million seafarers. Shipping is the soul of world economy & of more than 90 percent of world trade, and it is seafarers who ensure the circle operates easily, providing the essential items and merchandise on which the world rely. The International Day of the Seafarer this week (Monday, 25 June, 2012) which aims to pay tribute to the world’s 1.5 million seafarers. This Day of the Seafarer, we would like to highlight the special intricacy that seafarer deal with everywhere. Right now, the greatest immediate risk seems to be piracy. However, sailors keep dealing with difficulties from poor working conditions, office risks and other risks in their atmosphere. Mariner’s Planet salutes all the seafarers who were upfront in every situation and conditions to serve us. This weblog is very excellent and so many beneficial suggestions!